Are you ready to become the greatest version of yourself? Are you tired of being bombard by all these new diet fads that simply don't work? Have you tried losing weight before but gave up because you never achieve any results? 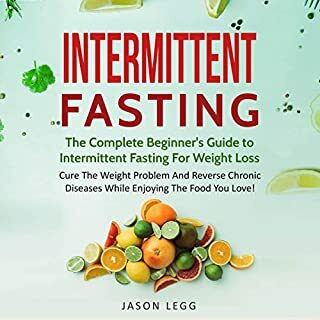 Inside this audiobook you will discover: What intermittent fasting is; Why you should choose Intermittent fasting instead of other diet programs; Different types of intermittent fasting; Intermittent fasting as a lifestyle; and Benefits of intermittent fasting. 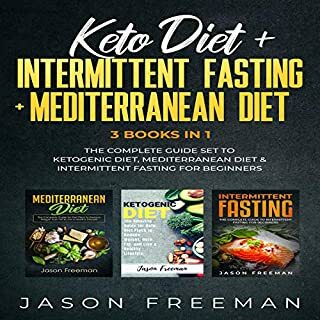 Get this three-in-one audiobook bundle by Jason Freeman to find the best advice and recipes on the ketogenic, Mediterranean, and intermittent fasting diets. Kayla Cox was a frustrated mom of three, who weighed 222 pounds when she discovered intermittent fasting. She eventually lost over 80 pounds using this method of eating, but she had mixed results at first. She finally realized her big mistake: she was making it too complicated. She did not need to count calories, restrict carbs, or even limit her portion sizes. She found the best results when she made her plan simple and easy. When she started to practice intermittent fasting six days a week, walk six miles a day, and take a cheat day on Sunday, she found she could lose weight easily and consistently. Have a print copy, STILL bought Audible version! If you have always been looking to improve your health and get that desired body that you want, then intermittent fasting may very well be the answer that you are looking for. With its science-based approach in harnessing the innate potential of the human body, weight loss and fat burn will come naturally while you still can get to enjoy your favorite foods. Fasting may be the solution to many of your health and weight issues. Fasting, when done correctly, provides a therapeutic approach that gives you fast, proven results regardless of your diet plan. 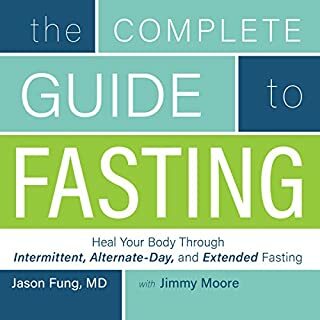 The BookSuma summary of Jason Fung’s The Complete Guide to Fasting brings you the main takeaways from the book in less than half an hour. Our experts have extracted the most important points from The Complete Guide to Fasting, distilling those key points into an easy-to-read summary for your convenience. This bundle includes the most powerful set of audiobooks that will help you improve every area of water fasting, intermittent fasting, autophagy, self-healing, and weight loss. It will quickly lead you to a more rewarding and fulfilling existence, as well as a more energetic and enriching professional life. OMAD helps you lose extreme weight fast. It is safe and sustainable. You can lose weight with OMAD even if you are not capable of doing strenuous exercise or follow a diet. OMAD intermittent fasting helps you modify the way you feed your body and enables you to begin the internal fat loss process and get rid of the belly fat. You can follow the OMAD routine even if you run a tight schedule and cannot make time for exercise. OMAD routine will work for you even if you are unable to follow restrictive calorie diets. Have you tried every conventional diet out there only to find out that they’re nothing more than empty promises? If so, the problem might not be what you are eating, but rather when you are eating it. A new, better kind of fasting is the solution to your weight-loss problems. Intermittent fasting isn’t some new fad diet - it’s an entirely different way of eating, one that is designed to help you get the most nutrients from the foods you do eat, while also helping keep your total calories down. Between the two, natural weight loss will follow, easier than ever before. For decades we have been taught that fat is bad for us, carbohydrates better, and that the key to a healthy weight is eating less and exercising more. Yet despite this advice, we have seen unprecedented epidemics of obesity and diabetes. Taubes argues that the problem lies in refined carbohydrates, like white flour, easily digested starches, and sugars, and that the key to good health is the kind of calories we take in, not the number. Is it possible to eat normally, five days a week, and become slimmer and healthier as a result? Simple answer: yes. You just limit your calorie intake for two nonconsecutive days each week - 500 calories for women, 600 for men. You’ll lose weight quickly and effortlessly with the FastDiet. Extensive research makes The Obesity Code a time machine to back when Western countries became fat nations, an extensive exploration of the hormonal human body, an exposé of the pervasive myths that keep people fat, and a clear path to systematic weight loss. Finally an approach to getting healthy and losing weight that actually works! If you want to lose weight, get healthy, feel great, and do it all without having to strain yourself with gimmicky diets, then this book is for you. Imagine 12 weeks from now...burning off more fat than you ever have, and easier than you ever have. Imagine having more energy and looking better than ever before - without going through all of the strain and stress of a typical diet. Forget everything you’ve ever been told about cellulite—it’s a myth! Ashley Black, fascia pioneer, and body guru to the stars, unveils never before known secrets to obliterating cellulite and changing your personal health paradigm. For years we’ve been conditioned to believe that cellulite is a fat problem, yet skinny girls have it, active girls have it, sedentary girls have it, curvy girls have it, older women have it and, guess what, so do younger women. In fact, 90% of women struggle with it...you are not alone! The appearance of fat is affected by the sticky webbing of tissue it’s housed in called fascia—which can be manipulated. Get ready for the most radical shift in health and beauty of the century! Obliterate cellulite, transform your body, and revolutionize your life! If you have been thinking about using intermittent fasting to lose weight but don’t know how, then you have come to the right place - read on! Many women swear by intermittent fasting, losing up to 10 pounds in three or four weeks, all without exercise! And without having to watch what they eat religiously! But there are also many who don’t know what it is and are thoroughly misled by all the misinformation readily found on the net. How you can use intermittent fasting without worries about loss of sleep and hormonal imbalance. You get all the benefits without the worries! A ready 30 day program that is tailored to get you started right off the bat with intermittent fasting. Seasoned with what-tos and how-tos, your intermittent fasting program will start off with minimal hiccups! Get the knowledge of how to incorporate intermittent fasting as a mom, and pick up two extra tips that absolutely are lifesavers! What to do and what not to do while fasting. You heard it before. But you get to know an extra four more steps that will definitely boost up your weight loss and make fasting so much easier! How to successfully combine the keto diet with intermittent fasting for women. What many others don’t tell you about the role of eating when you fast intermittently. This guide will be your handy companion as you work through and embark on your intermittent fasting journey. Weight loss is pretty much a fair certainty within four weeks, all without the need for exercise and watching what you eat! It’s an easy book for doing intermittent fasting. It’s an easy book for doing intermittent fasting. Some learning approach provided. Enjoying content. Learning stuff! About intermittent fasting for women. This book was so essential for those people who need this kind of book. In this book you will find all useful information you need to lose your weight, burn fat, heal your body to live a healthy lifestyle. I am so much happy to learn something about intermittent fasting for women. This is a very useful book. This book is easy for ultimate beginner directives for women's annoying fasting to reduce permanent weight loss. It’s a great informative book about fasting. Providing proven tips and steps. I am happy with this purchase. A great book for women to loose weight. A great book for women to loose weight. Love this cookbook. It has great recipes. All the recipes are delicious and easy to follow. Thanks author for this amazing cookbook. In this book you will get lots of valuable. 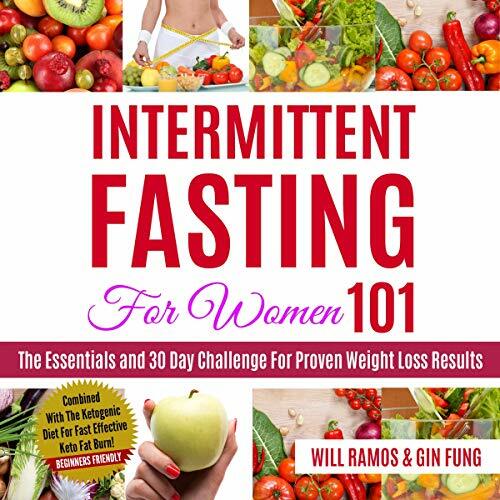 In this book you will get lots of valuable information about intermittent fasting for women. To control your weight you need this kind of book. The author done a great job in this book. The content of this book was so good and easy to understand. I will surly recommended this book. This was an excellent and informative. This was an excellent and informative intermittent fasting book for the women. Who want to loss there weight, this book was a perfect guide for her. This is the book you need for your IF. This is the book you need for your intermittent fasting. It is fun to listen, but most importantly. It gives you immediate success with delicious meals that will leave your family forgetting that they are eating healthier than usual! It is very energizing to peruse a book. It is very energizing to peruse a book which is all through gainful for everybody despite the fact that for the individuals who are stressed because of their over weight. You will find in this book how completes. You will find in this book how completes a writer uncovered the insider facts of intermittent fasting. There are numerous rationale and reason of keeping irregular fasting. This Intermittent Fasting book will change you. This Intermittent Fasting book will change your eating way of life into a progressively more beneficial one. I really liked this book and would recommend anyone who needs such type of information. This book contains full and complete information. This book contains full and complete information about interim fasting for women. This is a wonderful book with many simple and absolutely delicious recipes. Every page is full chock of memories, from the recipe to the photo. A well-planned chef, this book is recommended. If you have always been looking to improve. If you have always been looking to improve your health and get that desired body that you want, then Intermittent Fasting may very well be the answer that you are looking for. I am completely happy with this book. I am following this book I can know bunches of things about Intermittent Fasting For Women. I am completely happy with this book. Highly recommended! This book providing lots of useful information. 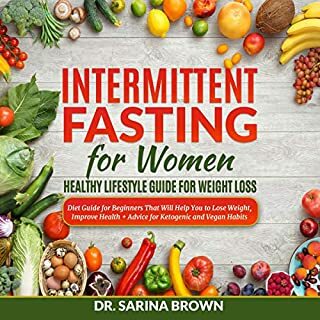 This book providing lots of useful information about intermittent fasting for women. This book was very well explained. Think of it like finding that absolute perfect fitting outfit. Health is wealth and when it comes to woman we are very much conscious about our weight and health. This author is very helpful and informative. This author is very helpful and informative. He also provides many positive, supportive suggestions and resources. I highly recommend this book! It is a well logical and learnable book. It is a well logical and learnable book. This book writer shares bunches of tips and tricks it's significant. This book the majority of the information exceptionally straightforward. Really great information, well organized. Really great information, well organized includes in this book. 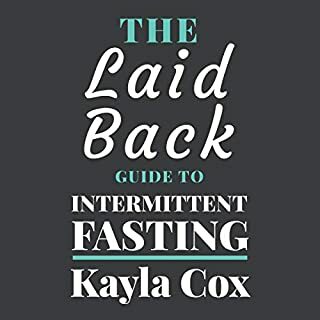 If you follow the guidelines and principles of Intermittent Fasting I discuss in the book, you WILL achieve that lean, flat and toned body you've always wanted. An excellent introduction to intermittent fasting. An excellent introduction to intermittent fasting. The recipes are yummy and make fasting easy and painless. Excellent book. I had started the ketogenic diet seven weeks ago. As I progressed with the diet the hunger started disappearing. Take the time to read the foreward because it does explain some very useful insights into why things may or may work. Amazing book! Well done. 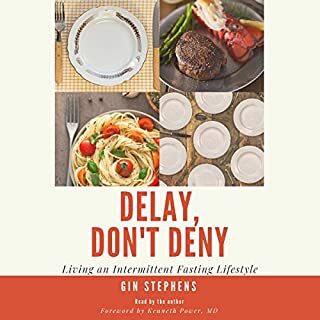 A great collection of intermittent fasting books. A great collection of intermittent fasting books. Well explained and researched. Impressed with the amount of work that went into this. Look forward to reading the author’s other works.